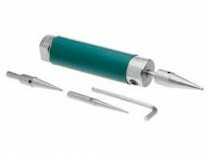 Big Eye needles are created by soldering the ends of 2 needles together to form an eye large enough to allow virtually any item to pass through it. Wire rounder, 5-1/4 inches with 1.8mm cup. Sold individually. 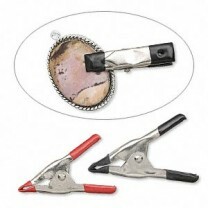 The wire rounder tool is an effective way to smooth the end of cut wire, up to 14 gauge, by placing the cut end into the cup and twist the handle several times. 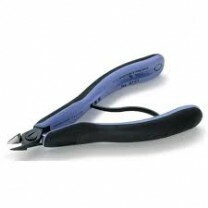 These flush-cutters are the Rolls Royce of all cutters, the only cutters worth having if you want a professional finish on your wirework and beading. Providing ultra flush and precision cutting, they are designed for a lifetime of use if looked after properly. Cuts up to 1.25mm (16 gauge). Rubber coated bonding clips, 5cm (2-inch) length. 2 per pack. Use bonding clips to temporarily secure beads and findings in position. They are commonly used to stop beads from coming off the other end of stringing wire while stringing from one end. Tips are rubber-coated to protect delicate surfaces. 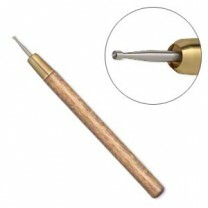 Viking Knit tool, Lazee Daizee™, plastic / copper / fabric. 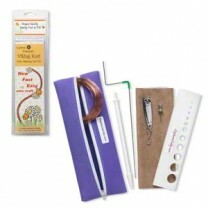 The Viking Knit tool set includes a wire weaving rod with a 6-loop easy-start head insert and anchoring hole, pin tool, draw plate, felted conditioning cloth, wire clipper, 26 and 20-gauge dead-soft copper practice wire, travel case, color instructions and draw chart. Packaged in thermo-formed clamshell. Color of cloth may vary. Made In The USA. This ergonomic, non-slip grip crimping tool is perfect for corrugated crimps which are perfect for use at both ends of all beading wires to secure the strand. 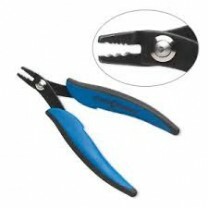 The plier measures 5-3/4 inch with two folding cavities. 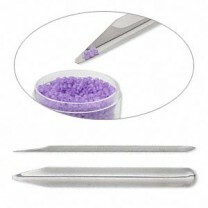 The Artistic Wire® CONETASTIC™ mandrel set is used to create custom bead cones and bead caps. The 3 different sizes of cone mandrels fit into the base of the tool for easy storage. Written instructions included.